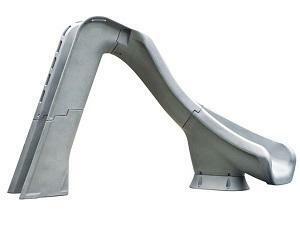 This multi-market, open- or closed-flume slide is available with a ladder or a spiral staircase - you decide! 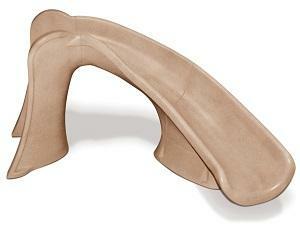 The flexibility of this slide is perfect for commercial applications. The high-volume water delivery system gives you up to 30 gallons of water per minute. Specifications: Height: 10'7" overall, 7'6" to the seat. Corkscrew flume is 19' in length. Required deck space: 11'4" by 9'9" (with staircase), or 9'9" by 9'9" (with ladder. Weight limit: 325 lbs. 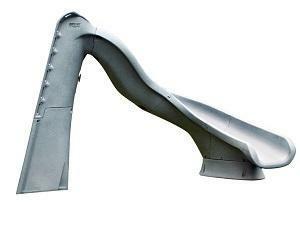 Children under 48" tall must be supervised at all times when using this slide. Due to current Saskatchewan Health Codes, The above slide is the only on deck slide that meets current codes (November 2016). Any Slide below would require special permission(over and above usually approval) from your Health Inspector before ordering. 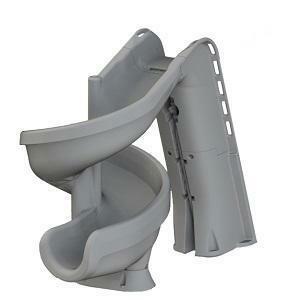 This slide will make a big splash with the little ones that enjoy your pool! The Cyclone incorporates many of the same great features of our TurboTwister, but in smaller proportions at just 4 feet tall. 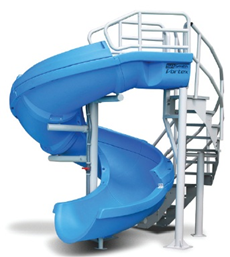 Loaded with safety features like molded handrails and an enclosed ladder, this slide fully complies with the US Consumer Product Safety Commission's Safety Standard for Swimming Pool Slides (16 CFR 1207). Specifications: Height: 4'-1". Available in right curve. Flume is 6'10" in length. Required deck space: 6'8" x 5'6". Weight limit: 175 lbs. Specifications: Height: 7'4". Available in right or left curves. Flume is 9'10" in length. Required deck space: 11'8" x 4'. Weight limit: 275 lbs. Specifications: Height: 7'-4". 360-degree flume is 12'8" in length. Required deck space: 9' x 5'. Weight limit: 250 lbs.